What Is Tamarind Paste and How Is It Used? Tamarind paste is made from a sour, dark, sticky fruit that grows in a pod on a tamarind tree. While some cuisines use tamarind paste to make desserts and even candy, in Thai cooking it is used mostly in savory dishes. Classic pad Thai is made with tamarind, as are some Thai curries and seafood dishes. Indian curries also call for tamarind. Tamarind is also a common ingredient in Indian and Mexican cuisines, as well as Vietnamese, Latin, and Caribbean cooking. It is also a key ingredient in Worcestershire sauce, contributing the distinctive tang. Tamarind paste is from the fruit—or pods—of the tamarind tree, specifically the pulp that surrounds the seeds within the pod. The tamarind tree is a common fruit tree that is native to Africa but now grows all over Asia and also in Mexico; it bears large brown pods that contain the tamarind fruit. The dark reddish-brown fruit is removed from the pods and must be separated from the seeds in order to become a ready-to-use cooking paste. Tamarind paste tastes very sour, with a somewhat citrusy taste. It does have notes of smoke and caramel as well, making for a complex flavor profile. Tamarind paste is easy to use straight from the container. 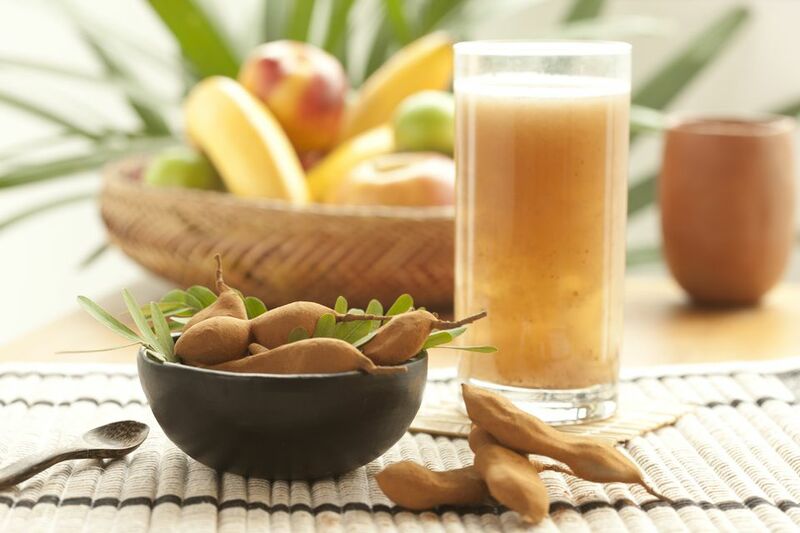 Because of its sour taste, whatever recipe you are making will need sugar or some kind of sweetener; when combined with sugar, tamarind gives dishes a beautiful, but subtle, sweet-sour flavor. The thickness and strength of tamarind paste vary widely depending on which brand you use. If the paste is runny, you will need to add more in order to achieve the right flavor. Taste-test your recipe to achieve the right sweet-sour balance, adding more paste or more sweetener until the desired flavor is reached. Tamarind paste is used in many types of Asian dishes, including noodle recipes, curries, sauces, and soups. It can also be mixed into uncooked dips and chutneys. It is ideal in a marinade since its acidic quality helps to tenderize the meat. Tamarind paste is also found in recipes for desserts and candies. There are two common substitutes for tamarind paste—one is a combination of vinegar and sugar and the other is fresh lime juice. The vinegar-sugar mix works well in dishes like pad Thai chicken. If your recipe calls for 1 tablespoon tamarind paste, simply substitute with 1 tablespoon vinegar mixed with 1 tablespoon brown sugar. If using fresh lime juice, substitute 2 tablespoons lime juice for every 1 tablespoon tamarind paste. Both substitutes work best when the amount of tamarind paste is 2 tablespoons or less. Neither substitute works well if the recipe you wish to make is based on tamarind as the number-one flavor ingredient, such as in a recipe for Thai tamarind fish; in that case, you will need to hunt down some tamarind paste. Tamarind paste is sold in a jar or plastic container. Since the paste is strong and condensed, one jar will last a long time. Tamarind paste can be found in some Asian food stores, but you might have more luck buying tamarind paste in Indian food stores. It can also be purchased online. If you'd like to try your hand at making your own tamarind paste, you will need to start with dried tamarind pods, which can be purchased in clear packages at Asian food stores. Open the pods and remove the fruit. Place the fruit in a saucepan with only a little bit of water (3 to 4 tablespoons of water to 1/4 cup fruit); simmer 10 to 15 minutes to soften. Remove the pan from the heat and use the back of a spoon or a potato masher to gently mash the fruit against the bottom and sides of the pan. Strain the mash to get a brown liquid. Press the fruit through the strainer to get as much pulp as possible into the liquid while straining out the seeds. Your tamarind paste is now ready to use. Note that homemade pastes tend not to be as strong-tasting as the bottled variety, so you may need to add more to your recipe to achieve the same flavor. Most jars and containers of tamarind paste say to store in a cool, dry place. You will find, however, that cooks who use tamarind often recommend storing in the refrigerator to ensure longer shelf life and freshness. You may have to give the contents a stir before using. Tamarind paste is high in vitamin C; it is used to break a fever and cool down the body in tropical countries. It is also employed to help with digestion issues, relieve a sore throat, and alleviate sunstroke. What is Tamarind and Where Do You Buy it? Is Shrimp Paste the Right Addition to Your Thai Pantry?